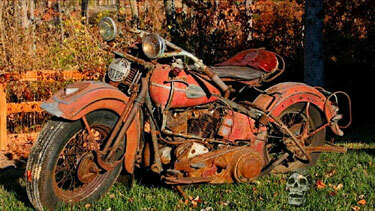 The motorcycle is a very early Harley-Davidson. But How Does it Actually Steer? No room for a passenger, and, boy! you better not lean back. From Twister Sifter via Vanderleun. And Ghostsniper succeeds very well in persuading me that I don’t really need one of these myself. I’m not a motorcycle guy. Some biker friends taught me to ride one a bit, back when I was a teenager. But I only ever owned one once. For some reason I’ve never understood, he decided I needed his bike. He had graduated and was going off to grad school, and he announced that he was selling me his Harley for $150. I don’t want it, I replied. You need it, he insisted. I’m not buying it, I said firmly. But he simply left it at my door, when he departed town, so I concluded I owed him $150, payable when Hell froze over or the swallows came back to Capistrano or whenever. I finally took a notion to try to ride the thing. I got my best mechanically-minded friend to help, and I climbed astride. Kick, I went. Sputter, it went. Then, silence. We kicked some more. We fiddled with it. We monkeyed with the beast for hours, but we just did not have our friend’s magic touch. We could not start it at all. I finally successfully traded it off for an ancient shotgun to a cousin of mine, and sent my friend his $150. I concluded that Fate just did not want me owning a bike. 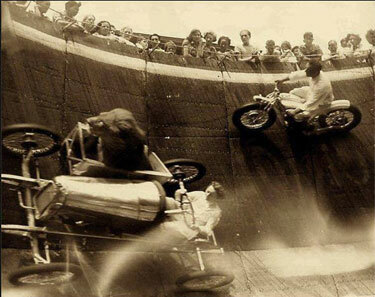 Taking lions for Wall of Death rides in sidecars. I think this is Marjorie Kemp with Sultan at Revere, Massachusetts. 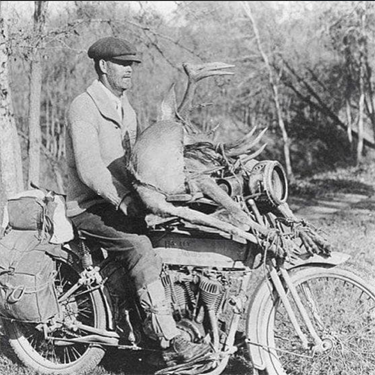 The motorcycle is probably an Indian Scout. The lion seems to be enjoying it. The R7 shows how deep art deco influence ran. A pure prototype, the R7 stands as one of the most stunning bikes ever created. The opulent mudguards, the fluid sculpture of the body and the ornate steel and chrome all lend to an unparalleled design for motorcycles. Its telescopic front forks also happen to be the first ever on a two-wheeler. 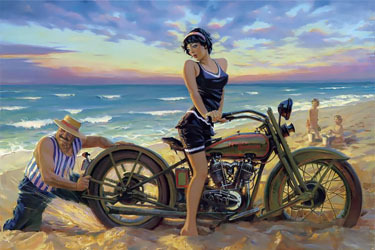 Every aspect of the bike contributed to its elegant design, including the enclosed gas tank, the smooth rocker covers and the uniquely shaped exhaust. 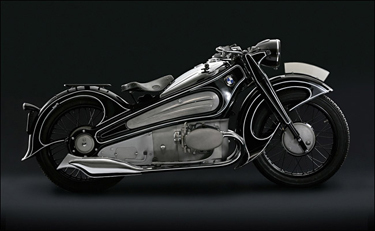 The bike was stored away in the 1940s and brought back to life by BMW Classics in 2005. Thank the motorcycle gods the R7 survived, since nothing else on two wheels looks anything like it, nor ever will. WebUrbanist posts photos of 20 spectacular motorcycle concept designs. Unfortunately, most of these will probably never actually be built for sale, and all of them are apparently not street legal. José Geraldo Reis Pfau is an advertising executive in Blumenau, Santa Catarina privince, Brazil, whose passion for motorcycles has led him to build a series of over 150 miniature cycles constructed from parts of broken watches and spectacles. 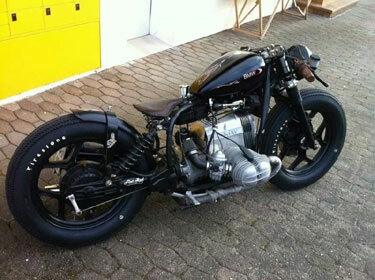 the Archives of Never Yet Melted in the 'Motorcycles' Category.